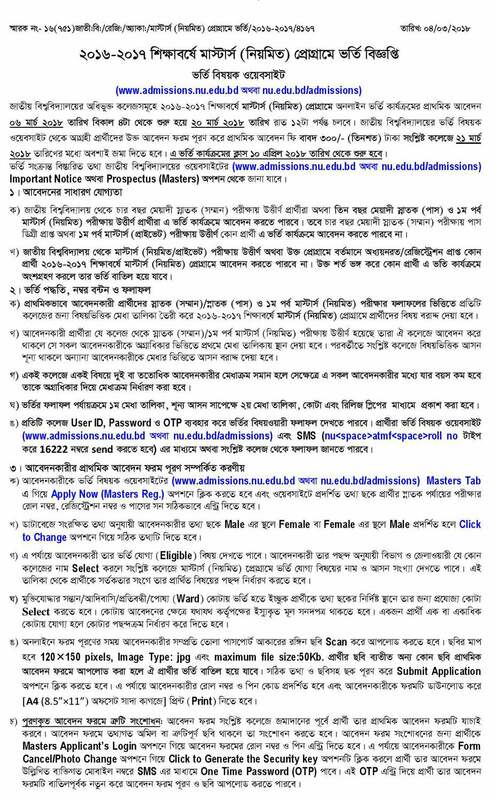 National University NU Masters Final Year Admission Notice 2018: National University NU Masters Final Year Admission Notice 2018 has been published by the authority of Bangladesh National University. If you want to apply for yourself, you should need to apply for National University NU Masters Final Year Admission Notice 2018. National University NU Masters Final Year Admission Notice 2018: NU Masters Final Year Admission Exam Result 2018-2019 will be published as soon as possible. NU Masters Final Year Admission Exam Result 2018-2019 which is the best option to complete for NU Masters Final Year. To Apply Masters Admission Release Slip Form through online. Student have to login by Admission Fill up Form Roll and Pin Number. So click Masters Regular Admission Release Slip Link (Given below) and Fill up Application form. Students have Select 3 College and complete Application Form. After Complete Application Form, Students have to Submit Application Form To Desire College. Student who passed Honors 4 Year Exam/Honors Pass/Masters 1 Year/Diploma in Library & Information Science can apply for Masters Admission. Eligible candidate have to apply masters form through online. Students have to fill-up masters final year form with honors or equivalent exam roll, registration number and exam year. A scanned color photo will need for fill up admission form. Apply for study Master’s final part choice one college which will be require for (before select your college please be sure your want subject have the college). After complete your form fill-up, print it on a4 size paper. Students have to submit application form with all necessary papers. And submit this along with TK.300 as admission fee.